This solid wood low loft bed provides sleeping and storage space for your kid’s bedroom. With a low loft design, the bunk is easily accessible for small children and includes safety guardrails on around the bunk. Making it ideal for small space living, this solid pine wood loft bed in a painted finish gives room for a play space or storing away toys in bins underneath the twin-size bed. 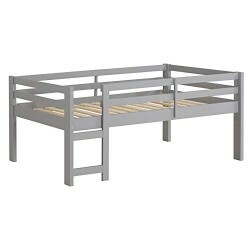 Including a side ladder to climb to the bunk and support slats for a twin-size bed, with no box spring needed.